Sony's Jumanji: Welcome to the Jungle has officially passed Skyfall at the domestic box office. The Jumanji sequel has become an unexpected smash hit and has won the last three weekends at the box office, beating out movies like Star Wars: The Last Jedi and this week, newcomers like 12 Strong and Den of Thieves. Now, with interest in the sequel high and positive word of mouth spreading, Jumanji: Welcome to the Jungle has surpassed the highest-grossing James Bond movie ever domestically. With the weekend box office factored in, Jumanji 2 has now made $316.9 million at the domestic box office. That puts it pretty well ahead of 2012's Skyfall, which made $304.3 million during its run. With a cast that includes Dwayne "The Rock" Johnson, Jack Black and Kevin Hart, in addition to Karen Gillan, who's become a big star in her own right after her work on Doctor Who and the Guardians of the Galaxy movies, Jumanji: Welcome to the Jungle was always expected to do well. But it's far exceeded everyone's most optimistic expectations. Since it looks like Annapurna will be distributing the next James Bond movie domestically, and not Sony, the studio really needed a hit like Jumanji. 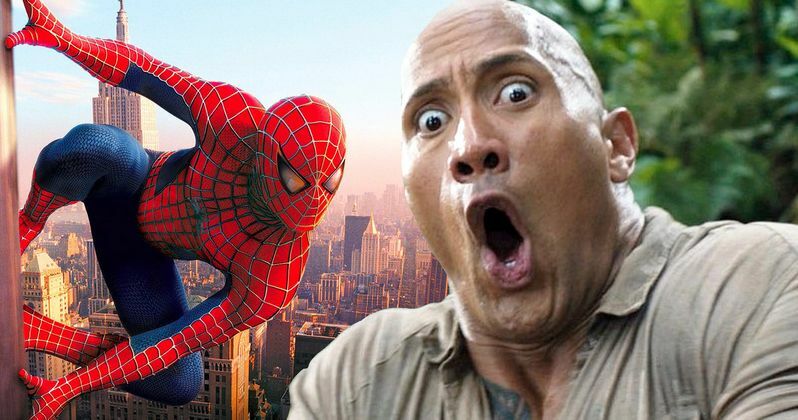 Not only has Jumanji passed Skyfall domestically, but it's now Sony's biggest hit that isn't in the Spider-Man franchise. Currently, the first Sam Raimi Spider-Man movie is still the studio's biggest domestic hit ever, having earned $403.7 million back in 2002. Jumanji: Welcome to the Jungle isn't likely to surpass that total. However, Spider-Man: Homecoming ($334.2 million), Spider-Man 3 ($336.5 million) and less likely, but not impossible, even Spider-Man 2 ($373.5 million) could be overtaken by the hit sequel. Worldwide, Jumanji: Welcome to the Jungle not sits at $767.7 million. That puts it just outside of the top 10 movies released in 2017. Pirates of the Caribbean: Dead Men Tell No Tales is in the ten spot with $794.9 million, but Jumanji has an excellent shot at crossing $800 million before the end of its run, which will take it into the top 10. It's also worth considering that Jumanji carries a reported production budget of $90 million, which is high, but not nearly as high as many of the other box office blockbusters that made this kind of money in 2017. That means Sony will likely see more profit, as a result. Jumanji: Welcome to the Jungle has been helped immensely by positive word of mouth. The movie currently holds a 76 percent approval rating from critics on Rotten Tomatoes, but a very impressive 90 percent audience rating. As noted by Box Office Mojo, Jumanji made just $36.1 million on its opening weekend, which makes this impressive total even more surprising. Hollywood should be able to take away two things from this unlikely success story; make a good movie and people will come, and never underestimate the power of The Rock.